You've probably received email from people pretending to be banks, credit agencies, even wealthy Nigerian expatriates. People lie about who they are all the time on the Internet. To make sure that nobody can lie about who they are when they use OTR, you can use authentication. Starting in version 3.1, OTR comes with a simple way to authenticate your buddies. Now you can see what your fingerprint is, as well as the fingerprint of the person you are talking to. But you still don't know if the fingerprint really belongs to your friend or to an imposter. To find out, you need a way to check the fingerprint. A simple way to do this is to phone your friend and ask them to read you their fingerprint off of their screen, so that you can check it against what you see. If the values are the same, then you know that you are not talking to an imposter. Regardless of whether you use fingerprints or the regular authentication method, you do not have to follow the above steps during every conversation. 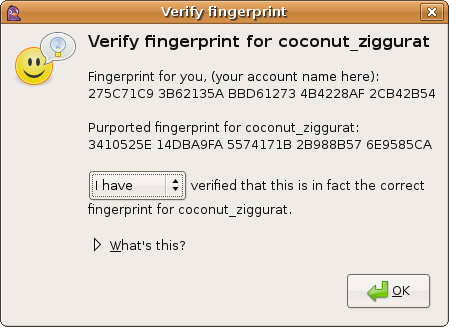 In many cases, you only need to authenticate each buddy once. A detailed description of when to authenticate may be found here.